Your playground awaits! In our spick-and-span and comfortable Blue Ridge, Blairsville and Hiawassee Cabin Rentals, you’re in the heart of breathtaking views, pristine nature, and adventures sure to please you and your family. You will be able to easily find some of the best places to eat in North Georgia and North Carolina Mountains Region, from traditional Southern home cooking and BBQ to fine dining. Excellent North Georgia hunting and fishing, including fly fishing. Experience the amazing excitement of catching your dinner. Scenic mountain motorcycle rides just minutes from your biker-friendly cabin with paved roads all the way. Visit the waterfalls and famous motorcycle trails. 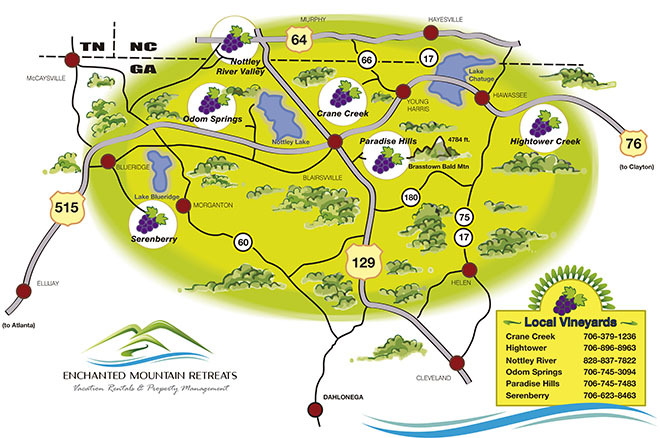 Tours of fine area wineries and vineyards on Georgia’s Wine Highway and enjoy our Enchanted Mountain Retreats Preferred Wineries Map. Exhilarating Zip Lines and Canopy Tours with panoramic mountain views for newbies like children to professional for Mom & Dad. Breathtaking sites for hiking and mountain biking aficionados. Plenty shopping, galleries, spas and so many more things to do in the Blue Ridge, Blairsville and Hiawassee areas to relax and enjoy. Unlike many other vacation getaways in the southeast, we offer all budgets wide variety of things to see and do in and around the mountains area. Below are some resources that we hope will help you well in scheduling your outdoor adventures during your vacation. Many horseback riding companies offer enjoyable trip for everyone of all ages and skill levels. Choose from a variety of options, including a one-hour journey and other types of rides: carriage rides, hay rides, moonlight rides, overnight rides with camping, wilderness rides... there's something for everyone, even the most amateur rider. Sip award-winning Georgia wines, enjoy a meal, and drink in the view. Many North Georgia wineries and vineyards offer wine tastings and winery tours. Some area vineyards also have restaurants. Find the best motorcycle roads, trips and challenging adventures. Get ready for espectacular rides in North Georgia Mountains. The Appalachian Trail (AT) crosses 14 states on its journey up the East Coast, but it begins (or ends, depending on your direction) in Georgia. Springer Mountain has served as the starting point for countless adventures and as a celebratory finale for those completing the 2,200-mile hike from Mount Katahdin in Maine. The crystal clear aquamarine waters of 3,290-acre Lake Blue Ridge make it one of Georgia's most picturesque mountain lakes. The lake was formed when Blue Ridge Dam was constructed on the Toccoa River in 1930. The Toccoa River, one of Georgia’s most pristine trout streams, resumes its flow below the Blue Ridge Dam and travels north into Tennessee, where it is known as the Ocoee River. Zipline is one of our top activities for family fun.Go through the mountains from the treetops, zip into the valley, soar over pastures and feel the freedom of flying. Security is the main concenr of all the zipline companies. You really should try it! Turn your stay in the mountains into the chance for resting, pampering yourself, rejuvenation and harmonize mind and body through the massages, facial and body treatments offered by spa's and wellness centers in the region. Lakes and rivers of the North Georgia Mountains are one of the main attractions for amateur and professional fisherman from U.S. and even other countries! The streams available in the area, are home to a wide variety of fish like trout, several types of bass, catfish, and much more. Amon the main places for fishing are: Lake Chatuge, Toccoa River, Rock Creek, Noontootla Creek and Cooper Creek. Golf courses nestled in the Georgia Mountains are breathtaking as well as preferred by professional golfers. Both private and public 18 hole courses are available, some are even open year round. The natural views and golf courses desing are unbeatable. All of them offer premier golfing experiences! Fresh, untouched and amazing are the waterfalls located near of Blue Ridge GA, and more than 100 waterfalls spanning across the mountains. Each waterfall offers a trail and different kind of hike for everyone. View a great area waterfall guide courtesy of the Fannin County Chamber of Commerce Get the Map. When thinking about outdoor adventure paradise, the North Georgia Mountains are your bet. Every year more than 300,000 people (local and visitors) experince the exciting waves, power and constant flow r of Ocoee River and other rapids. Float down the river, while you feel the fresh air and the sun warmth on your face. And then... burst with joy and lauhgter among your friends and family. This aquatic adventure is perfect to share with kids and adults alike. Definitely, Tubing is where excitement meets unforgettable times. Go further! Certainly, a landscape is not the same when you look it from a car window or riding a bike. The local mountains bring to you the chance to explore mother nature while you exercise a bit. Helen, Blue Ridge and surrounding areas, below you will find a list of suggested companies to plan a trip by train or helicopter. If an exploration spirit dwells in you, this activity is for you. Dare to live something different and try geocahing. North Georgia Mountains offer fantastic opportunities to enjoy outdoor activities and get in touch with Mother Nature!